Visionary entrepreneur Daniel Nissanoff breaks the news that the eBay auction phenomenon is about to explode in a big new way, revolutionizing how all consumers -- not just eBay mavens -- do their shopping, not only online but offline as well. The big payoff of this revolution will be that consumers will be able to "trade up" by embracing a new norm of temporary ownership. We will be able to buy more of the things we really want, because we'll also be regularly selling off the things we no longer want or need. 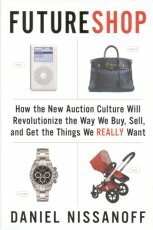 We'll be transformed from an "accumulation nation" into an "auction culture." Welcome to a world where Manolo Blahnik shoes, a Louis Vuitton handbag, a set of Callaway golf clubs, or a Bugaboo baby stroller will actually be smart buys, not indulgences. As huge as eBay has become -- now the tenth-largest retailer in America -- it has only scratched the surface of the potential for online buying and selling: by 2004, only 5 percent of all those who had bought something on eBay had also sold something on the site. But that is about to change -- dramatically. Nissanoff reveals that a massive growth of online auction "facilitators" is under way that will make selling so hassle-free, so reliable, and so lucrative that the masses of consumers who have stayed away will jump aboard. Most prominent among the the facilitators are dropshops, store fronts that sell goods more efficiently and effectively than you could ever do yourself. Thousands have opened in the last two years, with many more to come; they will soon be as pervasive as Starbucks. Daniel Nissanoff, who is at the center of the revolution as the cofounder of one of the leading-edge facilitator companies, takes us to the future and a new way of living, where buying the finer things is smarter. Along the way we're introduced to a full range of new businesses cropping up -- dropshops, authenticators, refurbishers and repackagers, personal reselling assistants, and closet cullers, as well as a wide variety of online shops that lease products, such as the hottest designer handbags and the latest-model golf clubs. He also reveals how all consumers can take advantage of these services for optimal shopping satisfaction and how entrepreneurs can get in on the booming business opportunities. Even as the auction culture offers consumers and entrepreneurs a wealth of new opportunities, it will also pose serious challenges for retailers and brand managers. Nissanoff analyzes those challenges and presents an ingenious set of strategies companies can employ to turn the auction culture to their advantage. As Nissanoff writes, "Temporary ownership means just saying no to second-best and letting yourself reach for the things that will thrill you over and over again -- guilt-free." Readers, start your auctions.